PL ,Trial Balance and Balance Sheet as per the JOB details. production for each finished good item. reduce the quantity of issuing item to production department. material will also return to store if not required. that it will be ready to deliver to customer. RealSoft VAT Compliant ERP Software Solution for Jewellery business in Dubai, Abu Dhabi, Sharjah and GCC countries. Integrated ERP, CRM, and accounting modules give you the complete picture. Every business has some unique requirements, customize to your needs, reports, forms or may be the automation and integrations that you need to run your operation. Find the real-time solution for effectively managing both the enterprise and retail precious metals business. 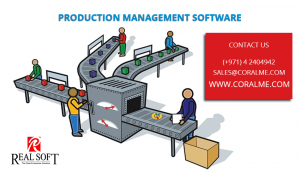 RealSoft Manufacturing is a powerful application to manage the entire manufacturing process of a company. This module provides various procedures to automate a production plant and enable efficient control over the entire process. RealSoft Manufacturing is a powerful tool which helps you to easily ascertain the cost at various stages of the production. ERP Software Provider in UAE over 15+ years.